The thirteenth annual collection of the previous year's finest short-form sf is at hand. Once again, award-winning editors and anthologists David G. Hartwell and Kathryn Cramer have gathered together a stunning array of science fiction that spans a veritable universe of astonishing visions and bold ideas. Hitherto unexplored galaxies of the mind are courageously traversed by some of the most exciting new talents in the field—while well-established masters rocket to remarkable new heights of artistry and originality. 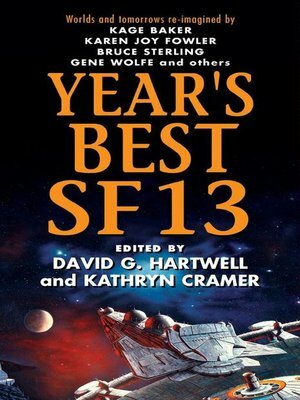 The stars are closer and more breathtaking than ever before—and a miraculous future now rests in your hands—within the pages of Year's Best SF 13.